We went on a short night hike, starting at Boarshaw Cemetary, reaching the monument on Tandle Hill, then walked back down to Slattocks where we caught the night bus back to District HQ where we spent the night. The weather was kind and we had an excellent hike. We continued our winning streak by winning the District Swimming Gala, both for the Scouts' events and for the overall District winning Team - an excellent effort by the Beavers, Cubs and Scouts. We spent the night at District HQ, playing games, finishing off our tin-can stoves then talking half the night before finally getting to sleep in the early hours. 3 Leaders and 4 Scouts took part in the second Peelers hike, a 15 mile walk from Bury Town centre, past Elton Reservoir, through Affetside, through Holcombe army base, up to the Peel monument, down through Summerseat, along the Irwell Valley Sculpture trail, through Burrs Country Park and back to Bury. We had every type of weather along the way, rain, sleet, hailstone and a little sunshine. We saw brand new lambs, cows covered in what we thought initially was blood, but when we got closer there were dozens of buckets of what looked like bright red jam which they were eating - presumably some sort of medicine or vaccine. We saw a newt in Holcombe army base, unfortunately it was dead, probably squashed by a soldier's boot - but good to know they live there. Some of us also saw the stoat that shot across the track in front of us near Burrs. The Scouts also had their first encounter with electrified fences - much to their amusement. We finally limped home after 7 hours and 45 minutes. See more photos from the event in the gallery pages. We put two teams into the event this year. Officially they came 4th and 5th out fo 9 teams, but the real placements are a mystery as there was apparently some confusion about the scoring! 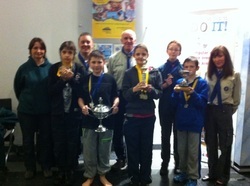 Despite this it was a great effort by the teams, with several new Scouts who have never done this event before. See more photos in the gallery pages. 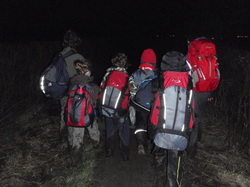 A team of four Scouts completed the 2012 Pike View Hike, a challenging hike across the area surrounding Bibby's Farm and Rivington Country Park. They had to navigate from checkpoint to checkpoint, without an adult Leader, completing challenges at each checkpoint. The weather was kind and the day was sunny, although not sunny enough to dry up the deep mud that covered much of the course due to the last few weeks of heavy rain. This was the team's second go at the event, and for some of them their last as Scouts, next year they will be entering as Explorers. See the gallery pages for more photos. This week it was the Summer Solstice - the longest day of the year. The plan was to set up base at Ashworth Valley, set off around 01.30 heading for the summit of Knowl Hill (where the wind turbines are) in time to watch the sunrise. However, the weather had different ideas with days of torrential rain and local flooding before the event and rain forecast for the duration of the event itself. Despite this we went ahead with the event, having a bonfire in the rain in the evening before packing our kit and setting off slightly earlier than planeed at 01.00 on Sunday morning. We folowed Ashworth Road North to School Lane then turned off onto wooded paths along the Rochdale Way. We eventually reached Edenfield Road where we stopped for a snack and a hot drink before heading past Red Lumb village and up onto the moors. The rain was constant and as we gained height on the moors the mist got thicker and visibiltiy was very poor. Using compass bearings we reached the summit of the hill, with the huge wind turbines looming out of the mist. We stopped at the top but there was no view of the sunrise, the mist just got lighter as the daylight arrived. We headed down the other side, again aiming for a turbine using comapass bearings then picking up the path heading South to "Owd Bett's" pub. From here we contined along the Rochdale way eventually rejoining Ashworth road and arriving back at camp at around 06.45. This was our second sunrise hike - neither of them had a view of the sunrise, but there's always next year! There are more photos in the gallery pages. 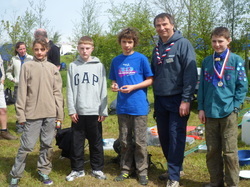 Five of our Scouts took part in the County Pioneer badge course. As it was taking place at Ashworth Valley we decided to camp there for the weekend too - despite it being one of the wettest Septembers on record! The weather was actually reasonably kind to us with just a few short light showers during Friday and Saturday. On Sunday it rained from 1pm onwards but we still finished the course. The Scouts learned lots of knots and lashings, how to use ground anchors and a block and tackle and used their new skills to build several projects on the Sunday. They made a camp gadget, a missile launcher, a monkey bridge and a swing and all earned their Pioneer activity badge. 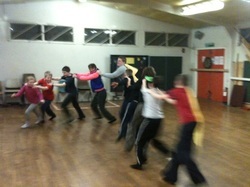 Eight of our Scouts attended Linnet Clough near Marple for our annual Autumn Camp. Three of them had just moved up from Cubs and were going to be invested on this camp. We arrived just before dark on Friday evening and set up our camp. It was very dark, and bitterly cold, by the time we were set up and were having well deserved hotdogs in the mess tent. The wood pile was empty so we searched in the dark bushes and undergrowth to find bits and pieces of dead wood to make a fire to keep us warm until it was time fro bed. It was at this point that we saw a badger strolling around the field. A couple of the Leaders saw him again at 1am when he crashed about in the mess tent, knocking over pans and dixies and testing things to see if they were edible. He bit a piece out of one of the washing up sponges! We woke up the next morning to a hard frost and discovered that the temperature had dropped to around -5 degrees centigrade, earning us the right to wear the much coveted Linnet Clough Polar Bear badge. After making breakfast (bacon and sausages), we split the group into two teams and sent them off into the woods to see who could make the best shelter from things they could find lying around. This proved to be very competitive with each team trying to "borrow" branches and materials from the other team's shelter. We stopped for lunch, making our own pizzas and cooking them in a camp "oven". We just had time to eat them before it was time to go to the shooting ranges to use the air rifles. The afternoon was spent gathering more wood and learning how to use saws and knives before preparing the evening meal (chicken Korma with rice). We spent a little time having a chat and a laugh around the campfire and making popcorn before the Scouts headed off early to bed. The badger may have visited again that night, but if he was noisy the sound of the heavy wind and rain kept his activities hidden - we did find though that he'd eaten all the dropped popcorn along with a few bits of chicken - complete with Iain's infamous (and quite deadly and ridiculously hot) "insane chilli sauce". Next time the 1st Middleton come to Linnet Clough the badger will probably stay well away! We got an extra hour in bed that night as the clocks went back. The heavy rain stopped just as we got up although it drizzled on and off for the rest of the day. After breakfast we headed off the "Cube", a high ropes course where we invested three of our Scouts on the "leap of faith". After this we packed up the wet kit in the rain and eventually headed off home. Unfortunately the wheel came off the trailer just before the motor way - not just the tyre, the whole wheel! Luckily no one was hurt but it meant our Group Scout Leader Derek had to help go and pick it up with his trailer, a job that didn't end till around 11pm. If we are lucky we will just about manage to get all the kit dry before next weekend's bonfire camp. There are lots of photos in the 2012 gallery page.